Hungary’s firebrand populist Viktor Orbán will face a serious test of his popularity in May when opposition parties try to coordinate their challenge to his ruling party Fidesz in elections for the European parliament. The opposition accuse Orbán of backsliding when it comes to democratic freedoms, but the Hungarian leader remains undeterred in his shaping of what he likes to call an “illiberal democracy” but what critics see as a semi-authoritarian state. Last week, an unrepentant Orbán launched Fidesz’s campaign for the 2019 European parliamentary elections in characteristic fiery style, lambasting Brussels for wanting to replace Europe’s population with migrants with the aim of destroying Christian culture and rubbing out nation states. FILE - In this Friday, April 6, 2018 file photo Hungary's Prime Minister Viktor Orban speaks during the final electoral rally of his Fidesz party in Szekesfehervar, Hungary. ​Since his reelection in 2010, critics have roundly denounced Orbán for what they see as a sustained erosion of democratic checks and balances. His curbing of judicial independence, politicization of the civil service and expansion of state control over the media and civil society have prompted protests and liberal outrage. Last month, the center-right alliance in the European parliament, the European People's Party, suspended Fidesz’s membership. The final straw for the EPP was an anti-immigration poster campaign featuring unflattering photos of European Commission President Jean-Claude Juncker and Hungarian-American billionaire philanthropist George Soros. Soros, a Jewish survivor of the Nazi Holocaust in Hungary, funds civil society groups that help migrants or defend human rights, and he has been a regular target of Fidesz, which Orbán foes denounce as anti-Semitic. Ironically, as a young man Orbán studied at Oxford University thanks to a Soros grant. Vadai acknowledges that Orbán has a “solid supporter base,” but notes that last year in Hungary’s parliamentary elections, which were won handsomely by Orban’s party, “more people voted against Fidesz than for it. “The problem is that the opposition parties are divided. Now a new process has started among the opposition parties. For example, for the local elections in October, I hope, we won’t be running candidates against each other. The biggest problem we have is fighting against each other,” she adds. Fidesz began life in the late 1980s – in the final gasp of communism – as a small libertarian student movement. But since the 2008 financial crash, it has morphed under Orbán into a populist national conservative party, even turning its back on free market economics – a move that troubles even some of his right-wing defenders. Orbán’s message is clear: National sovereignty is being undermined by globalization, and nation states and their traditional cultures and lifestyles are being weakened by bankers and elites. His scorning of Western liberalism has been music to the ears of the Kremlin, which, according to Russian officials, sees Orbán’s Hungary as an invaluable ally within the EU. The Hungarian leader has been critical of the imposition of Western sanctions on Russia for its annexation of Crimea. Orbán has cited Russia, Turkey and China as useful models for Hungary. Many of Orban’s domestic policies have been straight out of Russian leader Vladimir Putin’s playbook, says Peter Kreko, an analyst at Political Capital, a Budapest-based think tank. “Orbán has imposed his will on state media and much of the private-sector media has been bought up by pro-government oligarchs turning them into mouthpieces of the government. That’s similar to what has happened in Putin’s Russia,” he says. Russia has also been a “role model in terms of how to deal with NGOs,” he adds. “Of course, Orbán can’t go as far as Putin can with Hungary being a member of the EU. I wouldn’t want to say that Hungary is like Russia these days. Russia is a full-fledged authoritarian state, an electoral autocracy where elections are rigged. I think Hungary is becoming a hybrid regime but it is still a place where elections matter. But by the time you arrive at elections, the game has been twisted,” he says. 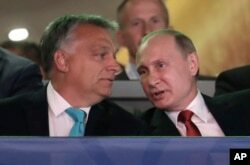 Russian President Vladimir Putin, right, talks to Hungarian Prime Minister Viktor Orban after arriving at the World Judo Championships in Budapest, Hungary, Aug. 28, 2017. But Kreko and other analysts say that Orbán’s attraction to the governance of Vladimir Putin and even China’s Xi Jinping is dictated partly by his critique of Western Europe. “He see Western Europe as less dynamic,” says Julius Horvath, an economic professor at the Sorus-funded Central European University. “You know the growth rates of Italy and some other European countries are much lower than Hungary’s. The Hungarian government is in a certain way very pro-business and is happy to attract business wherever it comes from with low taxes or longer working hours,” he adds. A measure passed last year raising the amount of time that employers can ask Hungarians to work, lifting the yearly cap on overtime to 400 hours from 250, and giving companies three years instead of one to pay for the work, has prompted opposition-coordinated protests. The amendment to the labor code has been dubbed the “slave law” by opponents and has infuriated especially Generation Y Hungarians — those in their 20s and 30s — who tend also to be highly pro-EU. Orbán’s political foes, from leftist factions to the nationalist Jobbik party, hope they can turn the cooperation over the ‘slave law’ protests into a lasting campaign of resistance that might erode Fidesz’ widely expected win in the European Parliament elections next month. and in municipal elections later in the year. Characteristically, Orbán’s aides blame shadowy foreign actors for the protests. The prime minister’s spokesman Zoltan Kovacs regularly scorns the opposition as weak, a plaything of a small minority of foreign-trained activists. 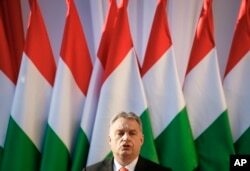 In one recent blog post he said Hungarians should be on their guard against the “Soros network putschists” who are hell-bent on toppling a popular government. But he says Orbán has to be careful not to push too far on the anti-EU front. “The population would not like a rupture with Europe,” he argues. Orbán knows his strengths and weaknesses, he says. “That’s why the Hungarian government downplayed Fidesz’s suspension from the EPP as a minor issue,” he adds. Kreko agrees, noting that Hungarians under the age of 40 in particular are Western-oriented and tend to speak English as a second language, unlike older Hungarians whose second language is Russian. “When it comes to working abroad, when it comes to studying, Hungarians go West, to Germany to Austria to London and to the United States — an ironic counterpoint to the government message that the West is on the decline,” he says.